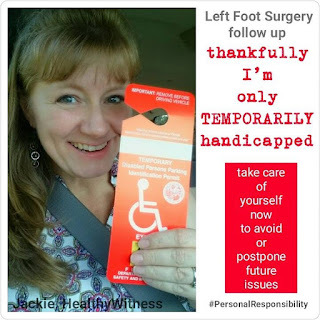 Jackie, Healthy Witness: Thankful Thursday! Are you taking care of any issues that you have now? Maybe your knees, feet or back ache or maybe your BP is borderline or you have swelling or arthritis somewhere in your body or a symptom that's just not quite right. Have you ever ask your doctor about them or sought out a specialist? Take care of your body now. It's the only one you have. The more proactive you are early on, the less maintenance or issues you will have later. It is obviously no guarantee, but it is worth taking care of things now when they might be a small problem rather than wait until they get worse. I will tell you it is worth it because you are worth it. It's no different than a car or a house or anything that you own that requires maintenance and parts. It is best to fix or repair them as they start to weaken or not function 100% than it is to wait until it's too late and more difficult to fix/repair. I am so THANKFUL that I was able to take care of my feet problems now. I was born with bunions that progressively got worse until adulthood. When I was 10 years old, a podiatrist told me I would have surgery eventually. I had successfully lost the weight I wanted to lose (2011-2013) and after two years of Maintenance (2013-2015), I wanted to add Fitness. During the time of adding Fitness (2015), my feet revealed more pain and problems then before. It was clear that now was the time to fix them. It is your personal responsibility for yourself and loved ones to keep yourself a priority. It is not selfish it is wise. You are loved and appreciated. Live your days as healthy as you can within your resources and do it with support. I am here to encourage you, share resources, and remind you that you are loved and you are worth the time. I am off to rest now, something I don't do very well. But it is because of others who encourage me and support me that help me make these decisions to be wise and properly care for myself so I can serve and care for others. It is my passion to serve you and encourage you because I know support equals long-term success. Don't put off something you KNOW needs your attention... Act now, while you're in control! Message me any personal or unique need that you may have. I enjoy consulting others in nutrition and fitness as well as healthy habits to support your personal goals.